The area bounded in blue on the map shows the area covered by flood alerts and warnings for Upper River Ribble, Hodder. 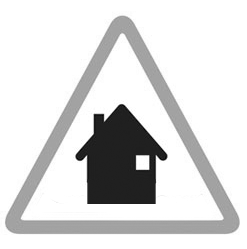 Higher Croft, Harwood House, Yew Tree Cottage, Beech House, Thorncroft, properties near Ease Barn Farm on Gallows Lane, and 19 to 22 Blackburn Road. Properties in Riverside, Greenside, those at Little Town near Ribblesdale House Farm, Osbaldeston Hall, Boat house, Lower Barn Farm, Waterside Farm, Stydd Lodge Farm, and properties on Salesbury Hall Road near Ribchester Bridge.